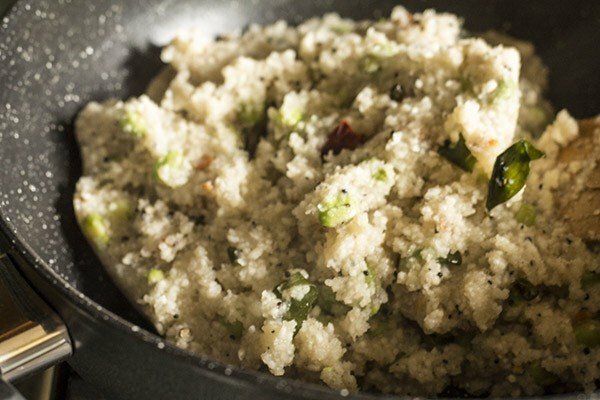 rice rava upma or akki tari uppittu recipe - an easy, delicious, authentic, traditional south indian breakfast recipe from karnataka, made with broken raw rice. 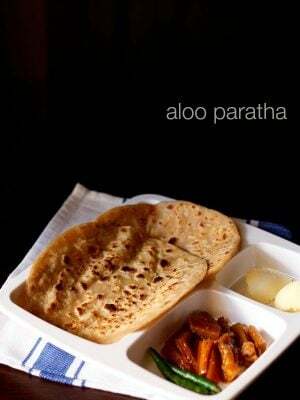 rice rava uppittu or akki tari uppittu recipe with step by step photos – an easy, delicious, authentic, traditional south indian breakfast recipe from karnataka. in this rice rava uppittu recipe, i have used lilva beans which are termed as avrekaalu in kannada. these beans are called as hyacinth beans in english. also known as surti papdi beans or vaal. these light green flat beans add a unique earthy flavor along with a bite in the dish. whenever i shop at the indian grocery stores, i make it a point to buy these beans frozen and store them and use them as and when i need them. 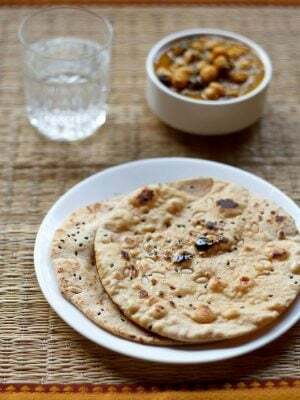 when in season, off course, they are available in plenty and can be used in various south indian preparations such as regular upma, akki rotti (rice flour based flat bread), avrekaalu sambar and so on. this rice rava uppittu recipe can be made with idli rava too. 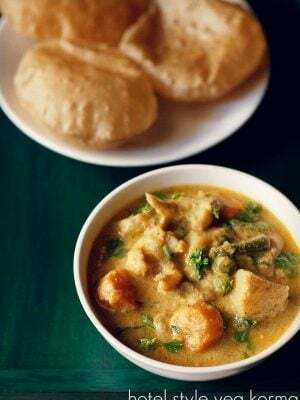 but please remember to add less water as, idli rava may not be able to hold the amount of water mentioned in the recipe. this no onion no garlic avrekaalu akki uppittu, can be served for breakfast or evening tiffin/snack. also can be a go to single pot lunch box idea. 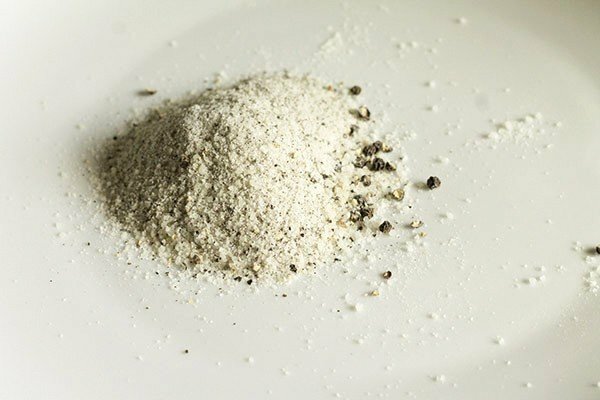 firstly, powder 1 cup of raw rice using an electric blender or food processor, running it briefly at first speed only. do not make a fine powder. the grains need to resemble coarse semolina. you can also pulse the rice a few times instead. coarsely powder the whole peppercorns next. you can even powder both the rice and peppercorns together. in a deep, thick bottomed pan, heat 1 tablespoon of oil. add mustard seeds, split chana dal, urad dal, stir them for a few seconds. 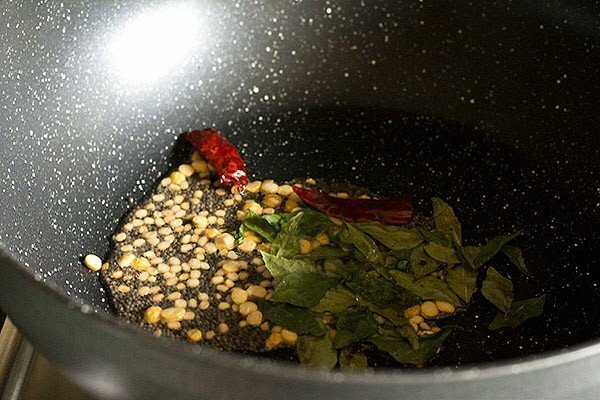 add finely chopped green chili, curry leaves and stir until the chana dal turns golden brown. 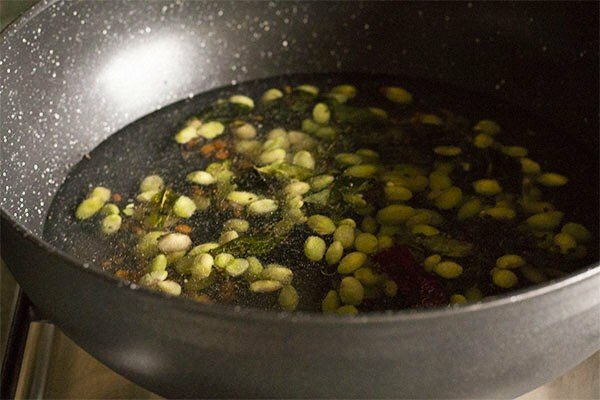 then add ¾ cup of lilva beans, stir so that they get mixed in with the tempering. following this, pour in 2 and ½ cups of water. add salt to taste. bring this to a boil. 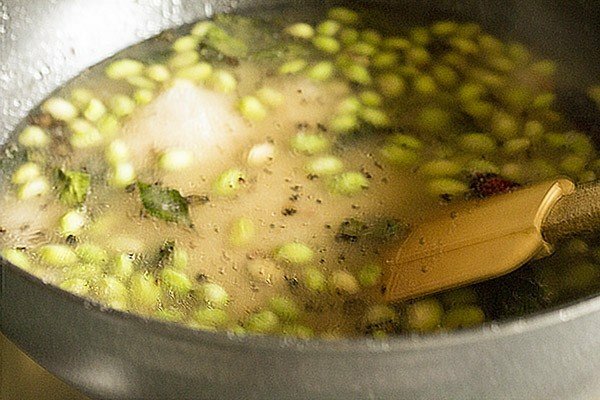 then simmer until the lilva beans cook through. then add the powdered rice and peppercorns, give it a mix using a spatula. cook stirring now and again very well. break lumps if any. continue to cook until all the water gets absorbed and the broken rice cooks through. this should take around 7 to 9 minutes at low-medium to medium heat. once the grains are cooked through, turn off the heat. cover with a lid for another 2 minutes. 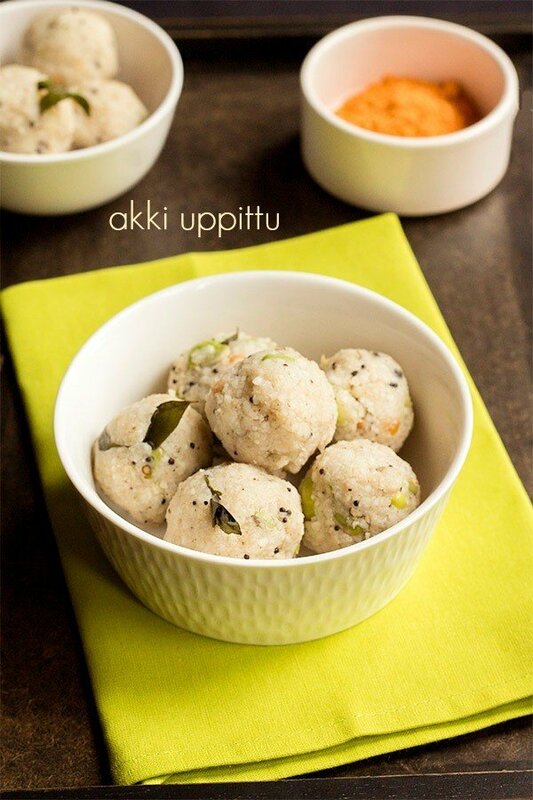 serve rice rava uppittu with curd or chutney powder or pickle of your choice. adding a teaspoon of ghee while serving enhances the flavor. but this is optional. 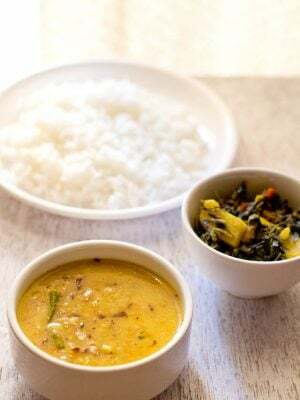 - as an optional addition, you can add 1 tablespoon of tuvar dal/split pigeon peas while grinding the rice and peppercorns and follow the rest of the recipe as mentioned. - you can also add 1 to 2 tablespoon of grated fresh coconut to the dish. if you wish to add, add the same when the water comes to a boil. 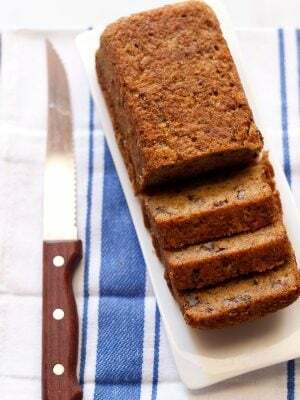 - adding a teaspoon of ghee while serving, adds a lovely flavor. this is however optional. 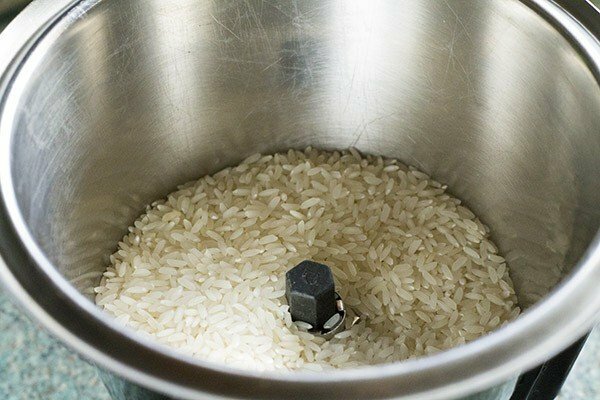 1.take 1 cup (200 grams) of raw rice in an electric blender or food processor. 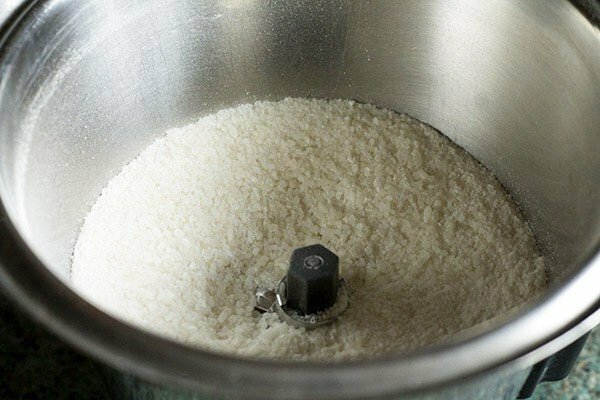 2. running the electric blender at low speed at short bursts or pulsing intermittently, coarsely powder the raw rice. it should resemble rava or sooji. just grind coarsely. remove and keep aside. don’t make too fine, as then too many lumps are formed when making upma and they are difficult to break. 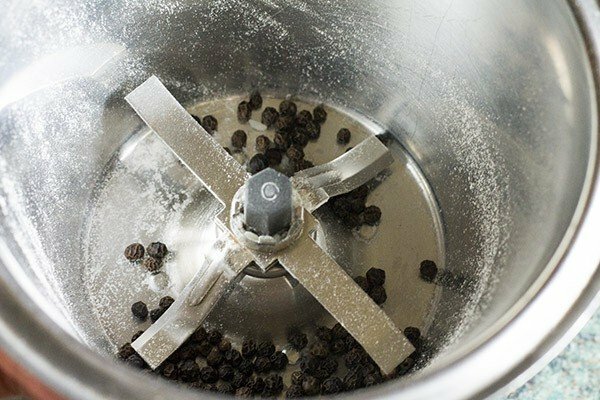 3. in the same grinder, also powder 2 tsp whole peppercorns coarsely. 4. the mixture of coarsely ground rice and black peppers, should look something like this. showing you a portion of the same. 5. in a separate thick bottomed thick pan, heat 1 tablespoon of oil. 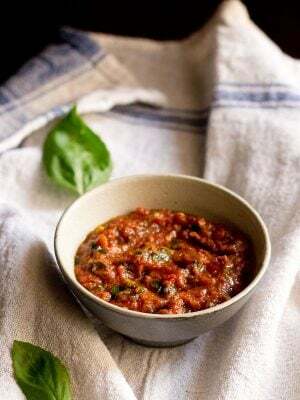 to this add 1 teaspoon mustard seeds, 1 teaspoon chana dal, 1 teaspoon urad dal, 2 tbsp curry leaves, 1 finely chopped green chili and 1 halved dry red chili. 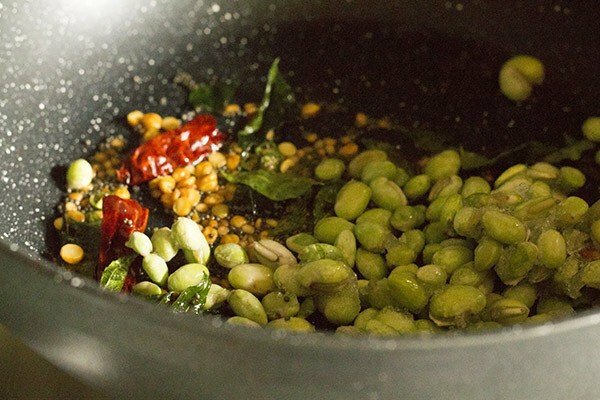 stir this until the chana dal turns golden brown. 6. now, add ¾ cup of skinned lilva beans/hyacinth beans. 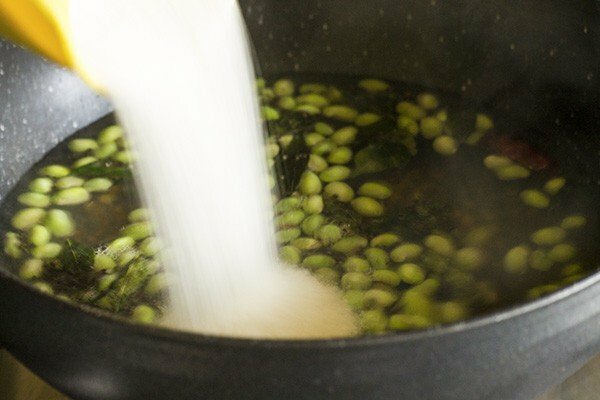 stir to mix these in with the tempering.instead of hyacinth beans, you can also use tuvar lilva or fresh pigeon peas. 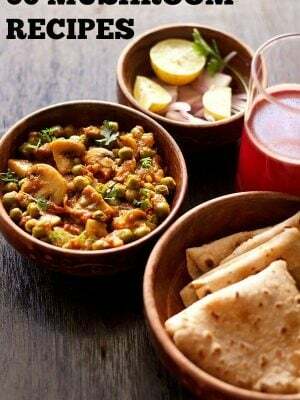 you can also use green peas. you can also skip the hyacinth beans. but adding the papdi adds a wonderful touch which is a family favorite. 7. pour 2 and ½ cups of water. 8. add salt to taste sufficient for the entire upma. bring this to a boil. simmer and cook until the beans are cooked through. 9. now, add the prepared broken rice and peppercorn mix. 10. stir these in and cook at medium to low-medium heat. 11. stir now and again to break any lumps and continue to cook. 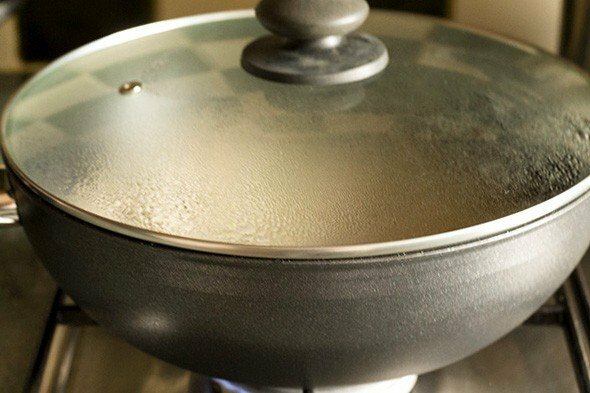 12. cook until all the water becomes well absorbed by the rice and the rice grains are well cooked. break any lumps if they form. 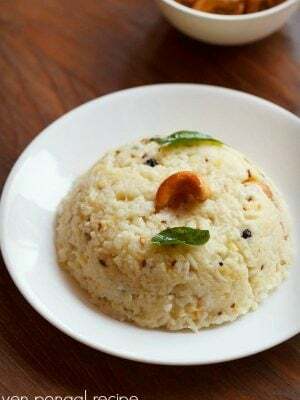 if you test out a tiny portion of the cooked upma by pressing between your finger tips, the grains should get mashed well, suggesting that the coarsely ground rice grains are cooked through. 13. turn off the heat and cover for 2 minutes. 14. serve rice rava uppittu hot adding a teaspoon of ghee (optional) with curd or chutney powder or pickle of your choice. you can also garnish with some coriander leaves. 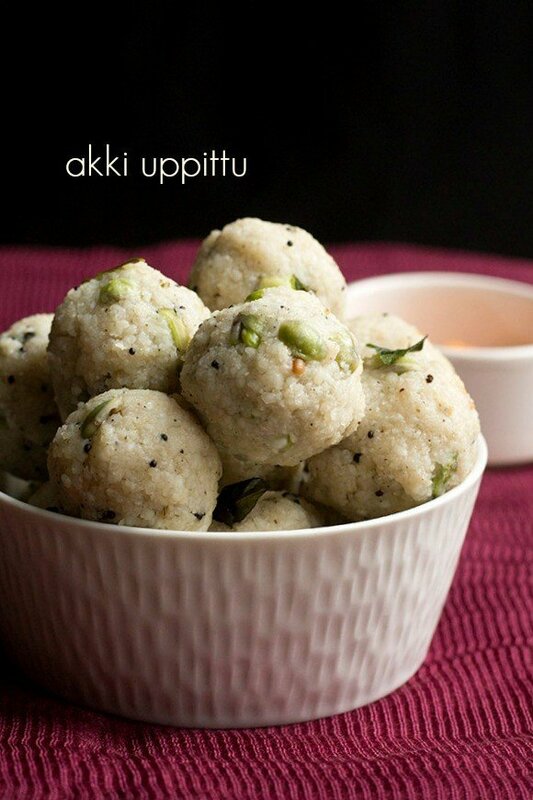 you can serve rice rava upma straightaway or roll the upma when slightly hot or warm, in balls and then serve. thanks rrs for sharing this useful info. 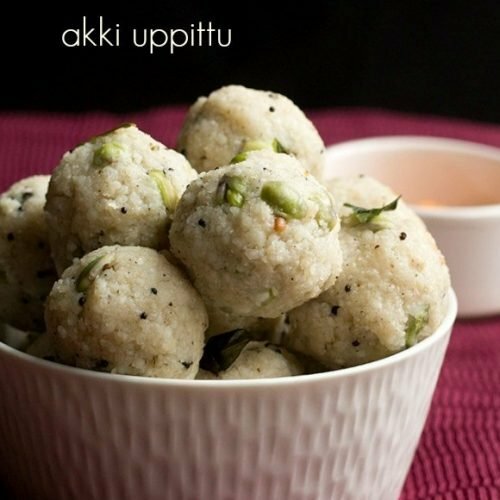 I always love uppittu.. N the roasted crumbs sticking to the bottom… Yum. And so does my hubby and son. 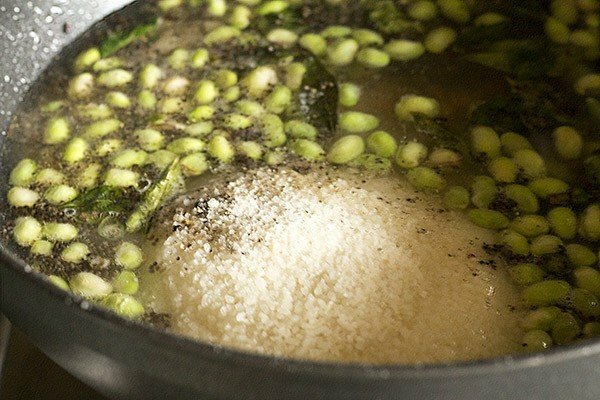 I have never tried adding Lima beans… Next time I m making it this way. I sieve my ground rice to separate the flour and broken grains. Flour tends to make upma sticky. Anu, very nice recipe! Brought back so many memories of my mom making this upma. My mom used to grind a handful of a tuar dal along with the rice. And the best thing to eat was the scraps stuck at the bottom of the pan! I’m crazy about Idli sambhar from childhood . Also Upma . Spices has o just right and aroma ? You can smell it from far . But now a days all that is gone . No flavor or the aroma . 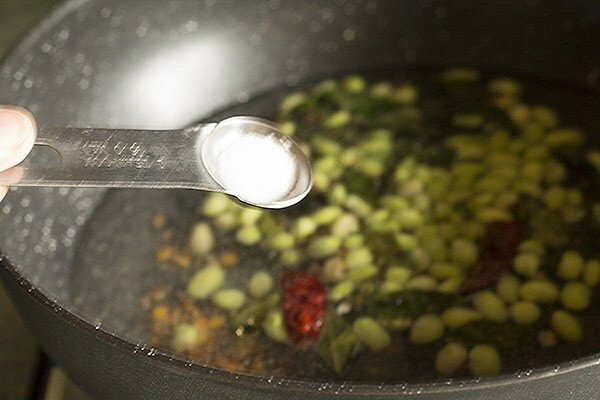 Can you give a recipe of sambhar powder ? will see if i can add.